Yesterday’s column spoke of problematic bits in children’s books that are edited out of later editions. These included casual racism, not-so-casual racism, characters smoking (the horror!) and the like. I was against said editing out. However, the value-learnt-in-childhood-reading that has caused me the most harm growing up? Was that brushing one’s hair was a good idea. One’s curly hair. My hair is not as curly now as it was in the days of my youth. Then I had Proper curls, now it’s an unenthusiastic wave. Most of the time, though, my hair was a disaster because I and everyone else in my life believed that the best way to keep it in order was to brush it. Children’s writers (especially girls’ writers) seemed to pay a great deal of attention to little girls and their haircare. Gwendoline Lacey from Blyton’s Malory Towers was vain because she brushed her hair a hundred times a night. Kathleen (I think?) from Blyton’s Whyteleafe series had no friends because she was unattractive and didn’t brush her hair a hundred times a night. The Chalet School and Barbara involved (I have ranted about this elsewhere) Matron ordering Barbara to “slip on your dressing-­gown, sit down at the mirror and give it a good hard brush­ing. A curly crop like yours needs that twice a day if you’re to escape tangles and pullings. … start at the crown of your head and draw the bristles down with a firm, steady stroke. Go all round your head and if you do it rightly, your scalp should be tingling by the time you’ve finished.” (They were big on tingling scalps at the Chalet school. One imagines the students wandering around like so many little clouds of static). And so (via Fusenews) Underage Reading asks the question that all of us with curls have been asking for years. Did these authors know no people with curls who could point out to them the error of their ways? Did none of them have curls themselves? Did they and all the curlyheaded people in their circles just go around sporting badly maintained shrubberies? It is all very mysterious. Be warned therefore, writers for children. Your victims readers could spend the rest of their lives as one long, nightmarish bad hair day. And it would be all your fault. I’m 23 with naturally very curly hair. I keep it shorn very short because it’s easier – and because I’ve reached the age of 23 still not knowing what I’m meant to do with it! So what are us curly-haired lasses meant to do if not brushing? I really can’t bear knots, so I’ve always (while I had hair at least) been a brusher! Now that I think about it….It IS true that children’s books do show a lot of fixation on hair-like issues. Heh, thanks for linking to my complaint about this (I am amazed, and amused, by how many people emerged with strong feelings about this! Glad it wasn’t just me), and: your post is hilarious. Why have you stopped writing for zeitgeist !! Have been a regular reader there and now am here ! BTW, I am enjoying borribles !! 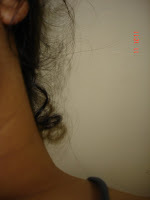 Anji – gentle detangling with fingers, use of wide toothed combs, conditioner and almost unlimited patience there are some pretty detailed comments at the Underage Reading post). I like your short hair though! Murphy – Eep. I hope not! Death Pixie – I don’t think this is true of books-for-boys, though? Hilariously, I was reading the new China Mieville book after I posted this, and he has his police characters noticing the quality of hair of a dead body. Elizabeth – There are entire generations of curly haired women who have been destroyed by this. Clearly we should all form an alliance. Ananth – I’m confused! I’m still writing for Zeitgeist, and my column is on the same page as it’s always been on. Really! I can positively state that there is no article from you in the last 2 Saturday editions. I am assuming that my eyes did not deceive me here. Anyways, will keep my eyes peeled. I enjoyed borribles, got to start the next one. Between the borrible-mania, I am reading wasp factory by Iain Banks. Weird yet fantastic ! Do you indulge in reading strange fiction? You know Sally Hope is completely lame and irrelevant right away when her straight, lifeless hair is described. Ananth – The column appears fortnightly and so should definitely have been on the Multiverse page (next to Vir Sanghvi, on the left!) of Zeitgeist. It was certainly visible in the e-paper, and other people seem to have seen it since I got a couple of emails discussing it. I’m not sure what’s going on – whereabouts are you? Ok Aishwarya, looks like I have an early case of myopia or whatever. Would make a trip to the eye doctor soon enough. Mesa is in Chennai, btw. Glad you like Banks – I am thoroughly enjoying wasp factory. BTW, any recommendations on the weird front would be nice (especially from a connoisseur like you !). I love Chuck Palahniuk too ! Comments? Haha, wonderful post. I'm glad I finally started reading newspapers again after condemning them for a long while. I found you through the Cochin edition of Zeitgeist, and I must say I've enjoyed your blog throughly. Keep up the good work and your from Cochin are you?